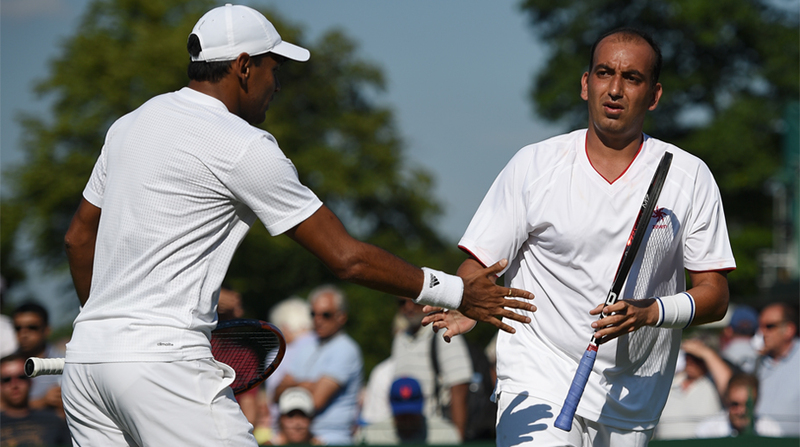 Purav Raja and Divij Sharan put up a brave fight but fell short against Raven Klaasen and Rajeev Ram. Purav Raja and Divij Sharan turned it around amazingly after losing the first two sets but eventually fell short in an energy-sapping five setter, shortly after Rohan Bopanna also lost his men's doubles second round at the Wimbledon championships, here. Raja and Sharan had a match point at 6-5 in the deciding fifth set but could not convert and ended up with a 3-6 4-6 6-4 7-6(6) 8-10 defeat against seventh seeds Raven Klaasen and Rajeev Ram in the second round. The gruelling match lasted three hours and thirty minutes on court 6. With Friday's results, India's challenge has ended in the men's doubles since veteran Leander Paes and Jeevan Nedunchezhiyan have already exited after losing their respective first round matches. However, Raja, Sharan, Paes and Bopanna are still in hunt in the mixed doubles event with their respective partners.